One of the, “It’s Your Neighbourhood” priorities this year is that we plotters do as much as we can to encourage and protect our native bees. It’s common knowledge that bees have been having a tough time of late. They are vital to the success of many of our crops and it makes sense for us to give them all the help we can. The Royal Horticultural Society has a nice wee video that shows in four minutes just how easy it is to lend our bees a helping hand. Plant nectar and pollen rich plants – those with open flowers that give easy bee access. Examples include Catmint, Lavender, Phacelia tanacetifolia and Sedum. Leave undisturbed some areas with naturally long grass, or at the base of bushes and hedges – these are the preferred, natural homes for bumble bees. 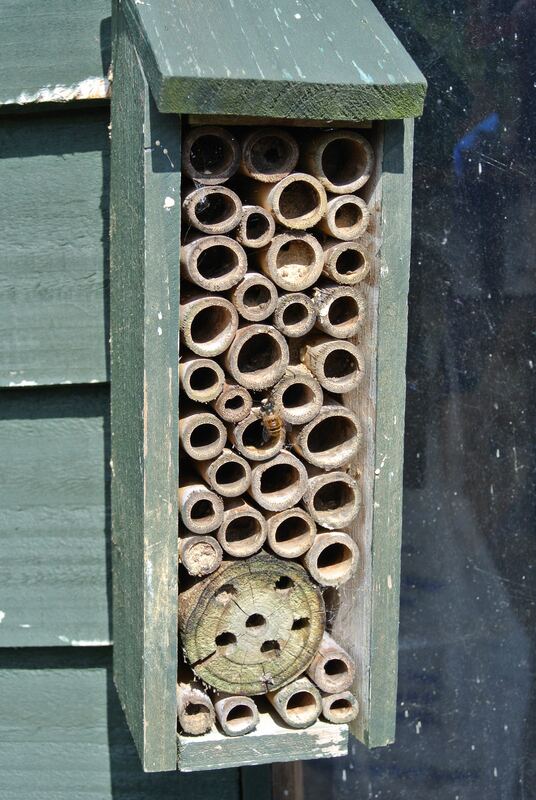 Put up simple bee hotels for solitary bees e.g Mason Bees, in quiet spots around our plots and public spaces. Avoid spraying with pesticides as much as possible. Take up bee-keeping – if you have the necessary experience or get appropriate training. On this last point, the City Council is reviewing its ban on bee-keeping on allotment sites and a new policy may be announced soon. So, what could GFAA do to be bee friendlier? Cometh the hour cometh ….